Highlights: Trekking inside Ugam-Chatkal national park upstream Koksu river to a mountain lake. The wildness of the gorge, rocks steeply breaking from 1.5 km altitude to the bottom of a grandiose canyon cause undisguised admiration. Beautyfull mountain ridges with all the year round snow-covered peaks, high-mountainous lakes, mountain rivers and springs with pure water, shady groves and various kinds of trees and flowers. Transfer from Tashkent to the mountain settlement Yakkatut (2 hrs, 100 km). Trekking upstream the Koksu river. Camp #1 on the bank of the river at the mouth of Zambotsay river at the altitude 1166 m. Dinner near a fire place. Continue of trekking through Koksu gorge. Wild nature, steep walls. The depth of the gorge-canyon is more then 1.5 km. Entrance to the natural boundary Ayrik. 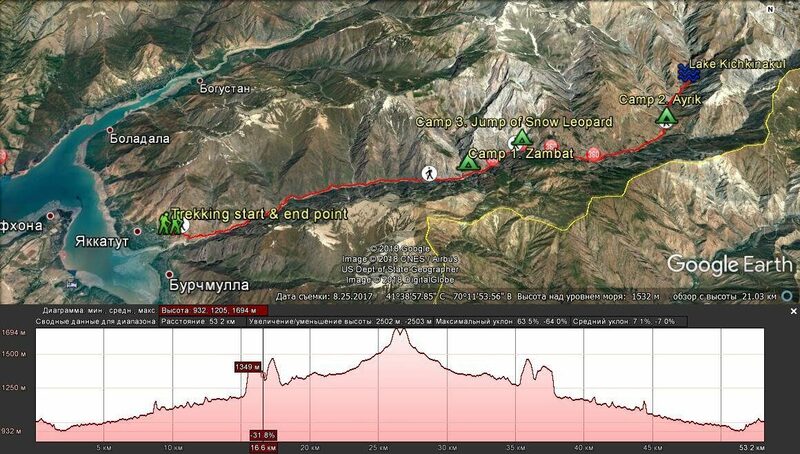 Camp #2 at the altitude 1390 m.
Day of rest. Excursion through the gorge of Ayrik river to Kichkinakul lake. Observing the fossils of sea animals and plants on the fragments of the rocks. 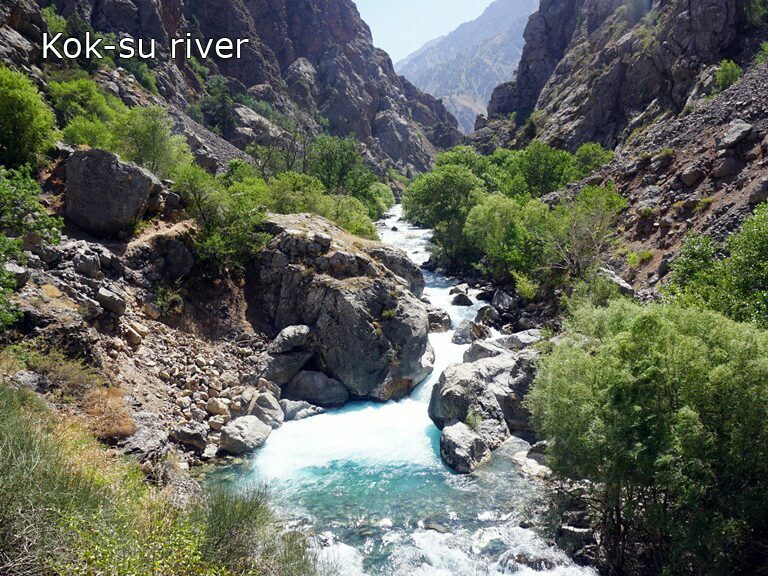 Beautiful sight of Piyezak river. Trekking to Koksu river's narrowing place between the rocks which is named "The jump of a snow leopard". Camp #3 on the bank of the river in the shady grove, near the stream at the altitude 1390 m.
Trekking to Charvak lake. The end of the route at the settlement Yakkatut. Transfer to Tashkent.